Imagine waking up to your favorite pop song, and the lights in your room correlate with the intensity of music – just by saying one simple phrase, “Good Morning Alexa.” You head to work in a more cheerful, ready to take on the world attitude. You arrive back at your house ready to enjoy dinner, and simply say “Dinner Mode.” All os the sudden, your house transforms into a personal and tranquil haven. Smooth jazz begins to play, and the lights in the room dim into a deep orange hue. It’s now time for bed, and with two words, “Goodnight Alexa,” your lights are off and crickets begin to chirp — putting you right to sleep. LUMOS is an Amazon Alexa skill, that creates an audio-visual mood by translating sound to light. Wake up, get productive, relax and party with LUMOS by your side! LUMOS aims to generate various mood settings for an everyday consumer, by combining the technology from Amazon Alexa and Phillips Hue Lights. 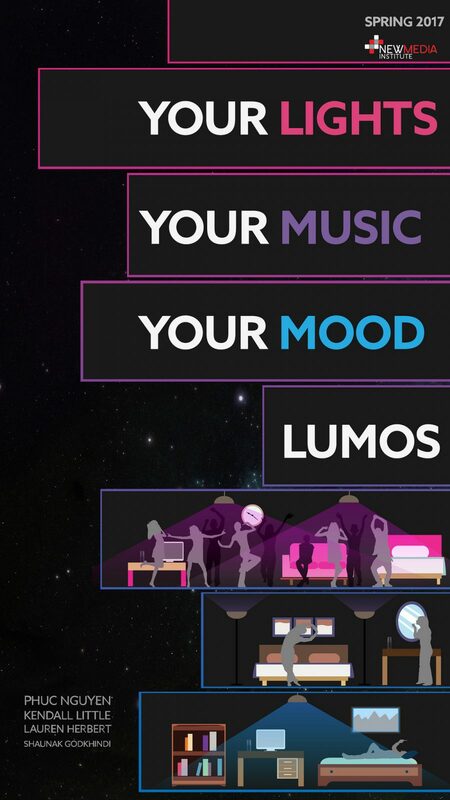 LUMOS identifies the need for a smart house mood skill — mood being the key word. LUMOS embodies the desire to create different types of environments, based on how the user is feeling in that exact moment. Who says your house environment has to stay the same? LUMOS can transform any room into something fresh. 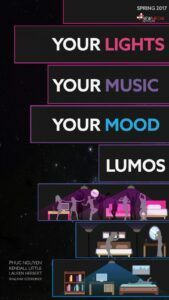 LUMOS will feature several types of moods to choose from including: morning, study, dinner, party and bedtime. Each mood has songs that parallels with the color, brightness, and saturation of the lights. LUMOS bridges Phillips Hue and Amazon Alexa, when steaming a song off Alexa, the frequency gets analyzed and dictates the saturation of the lights. High saturation = more color. Low saturation = less color. The communication between Alexa and Phillips Hue is constructed by a bridge. The bridge is hosted on Heroku, which is a cloud Platform-as-a-Service supporting programming languages that use web application deployment model. LUMOS uses Heroku because Alexa can not access it’s own local host. LUMOS has the potential to impact not only local users, but global as well. A LUMOS user can be any age, any gender, and from any demographic. Who doesn’t want the ability to create a mood with just one simple phase? The user will need to own Amazon Alexa and Phillips Hue to get the LUMOS experience. LUMOS is one of the kind. Through research, design and development, LUMOS is the first smart home mood creator on Amazon Alexa. Wake up, prepare, relax, party and entertain with LUMOS.